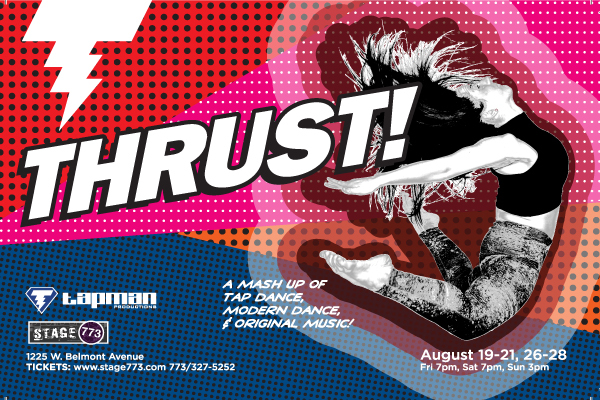 Tapman Productions and Artistic Director Tristan Bruns are proud to announce the first show in their 2016 - 2017 season, THRUST!, August 19 – 28, at Stage 773, Thrust Theatre, 1225 W Belmont Ave. The performance schedule is Fridays and Saturdays at 7 p.m. and Sundays at 3 p.m. Opening night is Friday, August 19 at 7 p.m.
Tickets to THRUST! are $20 and are currently available at the Stage 773 box office, www.stage773.com or by calling 773.327.5252. For more information on Tapman Productions visit TapmanProductions.com. THRUST! is a one of a kind double feature of tap and modern dance showcasing the work of long-time Tapman collaborators Tristan Bruns (tap) and Kate O’Hanlon (modern) and special guest choreographer Ian Berg (tap). The pieces performed are created specifically for this thrust (three-sided) stage with elaborate props and set design, original music by Trainwreck Symphony and composer Carolyn O’Brien, and new arrangements of popular music. Performers in THRUST! include Hannah Bailey, Ian Berg, Tristan Bruns, Martin Bronson, Zada Cheeks, Megan Davis, Juan Irizarry, Teresa Leahey, Gloria Mwez, Kate O’Hanlon, Carmen Paquette, Aimee Russon, Von Smith and Jessica Williams. The production team for THRUST! includes Bread and Roses Productions and Carolyn O’Brien, composer. Tristan Bruns is a tap dancer and choreographer from Chicago, who began training with Donna Johnson and has continued his training with Ted Louis Levy, Lane Alexander, Martin ‘Tre’ Dumas III, Bril Barrett and Sam Weber. Bruns has been a member of Jimmy Payne Jr.’s Perfect Timing and Julie Cartier’s Cartier Collective and is a founding member of BAM!, the performance ensemble of the Chicago Human Rhythm Project under the direction of Lane Alexander. He currently dances with M.A.D.D. Rhythms under the direction of Bril Barrett. Bruns has been among a hand full of dancers to be awarded the Audible Odyssey grant for new works in 2012 and 2013 as well as an Individual Artist Grant for New Works in 2013 and 2016 by the Chicago Department of Cultural Affairs and Special Events and the Outstanding Choreography Award at the Dance Chicago Festival in 2014. Bruns has a B.A. in Music from Columbia College Chicago. Kate O’Hanlon is a modern dancer and choreographer from Cleveland, Ohio. She began her early training with Michelle Petruzzi Gacom of the former Cleveland San Jose Ballet, Poppy Dinse, Gregory Daniels and Sara Whale and continued as a trainee with Inlet Dance Theatre. O’Hanlon’s work has been presented at numerous festivals in Chicago and across the country, including Dance Chicago, Kaleidoscope Dance Festival and Fringe Festivals in Atlanta, Indianapolis, Minneapolis, St. Louis and Washington D.C. She currently performs with Ardent Dance Company, Matter Dance Company and Untitled Project. O’Hanlon is the operations manager of Tapman Productions and also serves as director of the Modern Marvels Dance Company, a newly-formed modern dance ensemble. She often collaborates with her partner, The Tapmen Dance Company Artistic Director Tristan Bruns, utilizing a hybrid tap/modern approach to choreography. She holds a B.S. in Psychology and Minor in Dance from Baldwin-Wallace College. Ian Berg is tap dancer from Chicago currently living in Boston and attending the Boston Conservatory. He is multiform dancer that has extensive training in tap dance, ballet, modern, contact improvisation and many other forms. Berg is also trained musician and has experience in music composition. He premiered his first evening length work, About (chairs), in February 2014 and has premiered additional work since 2014 including his performance in Audible Odyssey. Tristan Bruns founded Tapman Productions, LLC (TMP) in 2012 establishing the company and its mission to produce new works with a focus on tap dance. Besides producing over 50 performances across the United States, Tapman Productions recently finished its first performance season at Chicago’s Athenaeum Theatre including the well-received The Adventures of Tapman, choreographed, written and original music compositions by Bruns; the experimental La Raison d’Etre, choreographed by Bruns and Kate O’Hanlon and Supreme Love, choreographed by Jumaane Taylor, and named one of 2015’s top 10 dance productions by the Chicago Tribune. Tapman Productions is also home to the Chicago-based tap dance company, The Tapmen (directed by Bruns), and its newest addition for the 2016 season, The Modern Marvels Dance Company (directed by Kate O’Hanlon). TMP offers a wide range of dance services not found under any one roof – TMP offers customized performances for private, industrial and charity/benefit events, workshops and master classes for students of all ages and levels, specialty tap floor rental and purchase and a tap dance/American history course designed specifically for home schoolers.